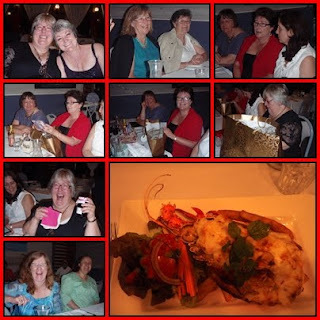 Last Wednesday night was my quilters Christmas dinner. We went to the Shoreline Restaurant and had a great night. The food was fabulous, even if the service was very very slow. we didn't get seated until 8 and left at 10.45. I had the most delicious lobster mornay, mmmmm. We also took this opportunity to thank Brenda & Esther for another great year of leading us.